Still have a ton of beets from your garden? 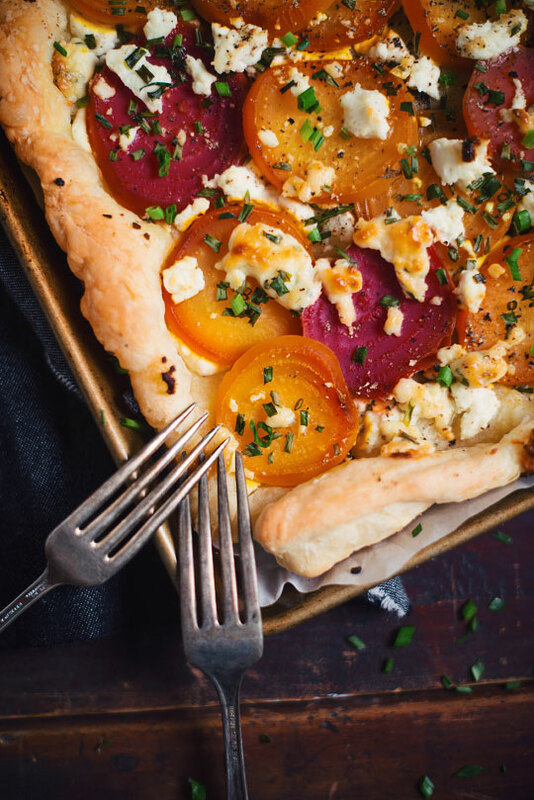 Jump on the occasion and cook this beet and Boursin cheese tart! Hard to “beet” with those incredible flavors!!! LOL ! Preheat the oven at 375°F. Line a 10”x15” baking sheet with parchment paper. Cut the stems and root but keep 1 cm on both sides. Wrap beets in aluminium paper and place on a baking tray. Cook on the oven for 1 hour or until beets are ultra tender. Let cool down 15 minutes before unwrapping. Remove skin by rubbing gently under warm water. Cut in 3 cmslices. On a floured surface, roll down flaky dough slightly bigger than 10”x15”. Place on the baking tray and roll the sides in order to create a crust. Spread half of the goat cheese and Boursin cheese then drizzle some olive oil on top. Add the beets followed by the rest of goat cheese and Boursin. Add 3/4 of the chive, sprinkle with Provence herbs then season with salt and pepper. Cook in the oven for 20 to 25 minutes or until crust is nicely golden! Garnish with the rest of the chive and add a drizzle of olive before serving! An astonishing Portuguese wine with an incredible freshness. It also has exotic floral notes that will seduce you! For a bold pairing, try this Jura wine from an excellent producer. Notes of cooked apples along with grilled hints that will bring the beet sweetness up front. 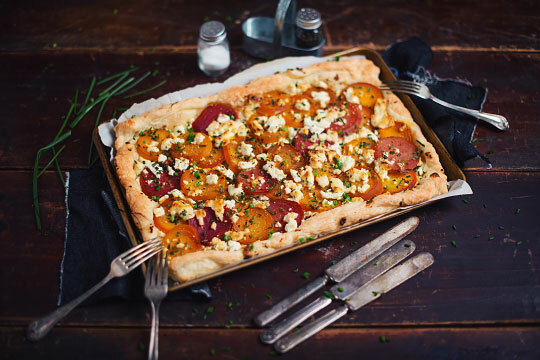 Since red beets and hibiscus makes such a good pair, this pale ale infused with hibiscus will be the ideal partner for this pie. The herbaceous notes of the beer will join those of the boursin and the chives. The moderate bitterness of the beer will contrast with the slight acidity of the cheeses.